Hanoi’s fire department will conduct safety checks on all 1,204 karaoke bars in the capital city following the deadly blaze on November 1 at a karaoke bar at 68 Tran Thai Tong Street that claimed 13 lives. 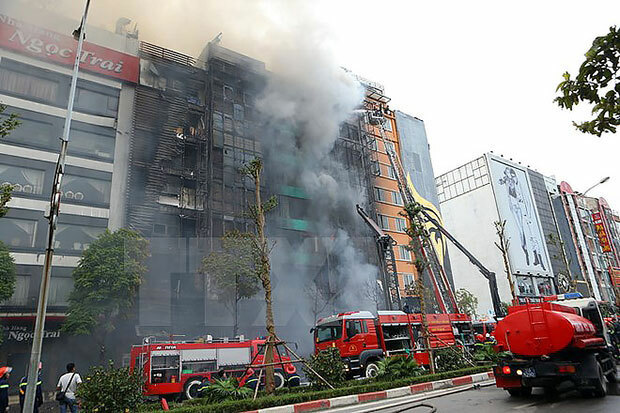 Deputy Director of the fire department Colonel Nguyen Tuan Anh said the checks began on November 2 with the aim of detecting inadequacies and shortcomings in fire prevention at those businesses. Regarding the fire at the karaoke bar at 68 Tran Thai Tong Street, Hanoi’s Cau Giay district, the colonel said initial results of investigation showed the fire was caused by negligence on the part of welders who did repair work on the building’s second floor. The Hanoi Police Department has commenced criminal proceedings against violations of regulations on fire prevention and fight at the 68 Tran Thai Tong karaoke bar. According to Major General Doan Viet Manh from the Ministry of Public Security’s Fire and Rescue Police Department (C66), the department on November 2 sent an urgent letter to police and fire prevention departments in centrally-run cities and provinces nationwide, warning the insecurity and high flame risks at entertainment establishments across the country. Since the beginning of 2016, twenty-three fires have been reported at karaoke bars nationwide, causing tremendous human and material losses./.